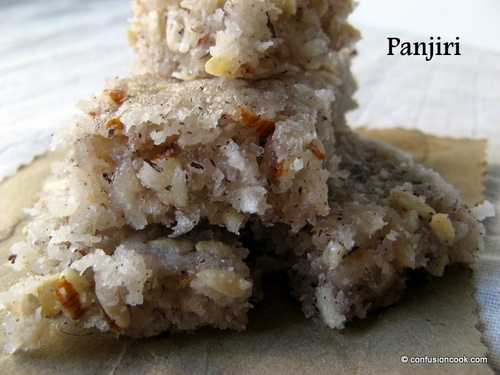 I’ve some very fond childhood memories attached to Panjiri. My aunt used to make them along with peanut chikkis a lot in winters for us. She would spread them on thaalis and leave them in the sun to cool & set. I used to just look and wonder at the process from a distance. I was re-introduced to this when I had my first baby. My mom gave me kilos of this to eat especially in the first few weeks after delivery. It helps in providing excellent nutrition and takes care of those mid-night/ odd hour snacks. I can’t begin to even tell you how hungry I used to feel for the first 2 months after delivery. Coconut is also a good source of Iron so I made them for my Mother-in-law during her chemo sessions. So go ahead – as a snack, comfort food or health needs, they are perfect anytime, anywhere. Dry roast coconut, almonds and seeds. Keep aside. Grease a baking sheet/ thaali with ghee/ clarified butter. Mix sugar & water in a heavy bottom wok. Allow it to boil on medium flame. Once the sugar is dissolved, add milk. Milk allows the impurities to be removed. A scum will form on surface, quickly remove it by skimming the surface with a spoon. You can strain it as well. Put back on flame and allow to boil a few more minutes. Dip a wooden spoon in the syrup & lift out. Allow to cool for few seconds as it would be very hot, then gently touch the syrup with clean forefinger. Now touch you thumb with forefinger & pull them apart gently. The syrup should form a single thread and should not break upon pulling apart. The threads are reached quickly after this point so keep checking regularly. Remove the syrup from flame and add in the roasted mixture. Quickly mix together. Quickly spread this mixture onto the prepared baking sheet. Smooth out the surface by pressing using the back of spoon/ spatula or fingers (be careful if using fingers as it is very hot). Using a knife, cut the spread mixture into any shape/ size you like before it cools. Allow it to cool completely. Last few steps have to be all done quickly for best results. Once cooled, gently remove the cut Panjiri and store.